At this year’s Sanctuary Cove International Boat Show, Superior Jetties has two major drawcards on-water – the LED-lit Waterscape pontoon and the innovative NautiBuoy platform – both award-winning and alluring. Superior represents NautiBuoy Marine, the 2015 DAME- Design Award winner at METS trade show. Launched in April 2015 after four years of development, the NautiBuoy inflatable platform, which features a patented modular air-toggle system and Velcro straps, has a wide range of uses: from a swim and sunbathing platform, to a jet-ski dock or as a sturdy base for carrying out essential maintenance tasks. Nina Anderson and Clay Builder developed the platform to fill a gap they saw in the market during their time working as superyacht crew. Available in various sizes and configurations, NautiBuoy is a versatile platform equally popular with superyachts as it is with sportsboats. Superior CEO John Hogan, who was joined at SCIBS by co-designer, Tim Endersby, says the NautiBuoy is already attracting the attention of superyacht crew, waterski clubs and other groups, keen to enjoy its myriad uses. 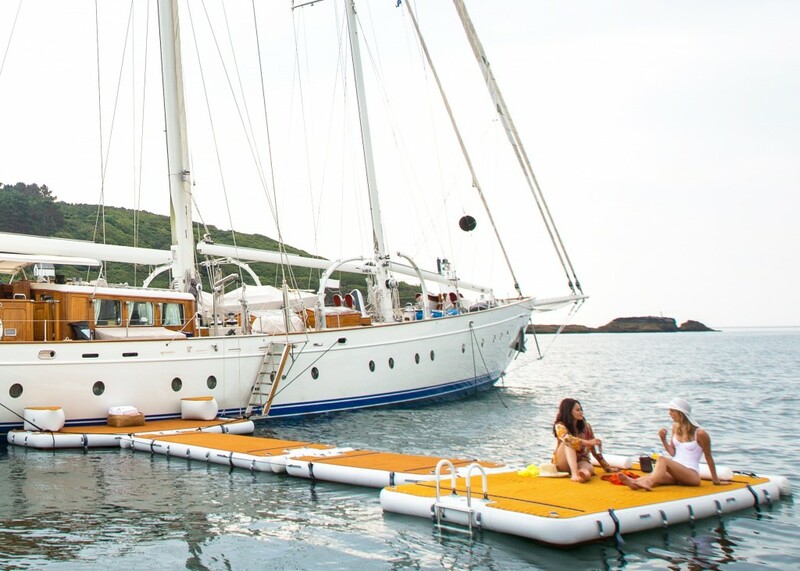 The NautiBuoy comes in two finishes: teak and diamond, depending on its application and the owner’s aesthetics, and both high quality PVC and heavy duty Hypalon. Delivery time from order is approximately eight weeks. On water, Superior has aligned with charter and brokerage firm, Northrop & Johnson Australia to create a Waterscape pontoon for VIP events adjacent to its luxury charter yacht display: the impressive 36m Sahana and 33m Corroboree, as well as the distinctive red-hulled Cresta 70 motor yacht which is for sale through N&J. Waterscape won the 2015 Good Design Award in the Sport and Lifestyle category, among various accolades in both the marine and mainstream markets. At its stand in the Superyacht & Marine Pavilion, Superior has a display of the various components its uses in jetski docks, pontoons and marina construction, including The UMD (Ultimate Modular Dock) System. UMD is made of tough polyethylene, is durable, non-slip, UV resistant and will not deteriorate in a marine environment. A selection of the award winning Waterscape-branded furniture are on show, doubling as a welcoming lounge for visitors and guests. The 28th Sanctuary Cove International Boat Show runs 19 to 22 May.